The NGO Proactiva Open Arms has reported that it has rescued three Libyan brothers, Allah, Ahmed and Mohamed, in the Mediterranean Sea in a pneumatic boat carrying 200 liters of gasoline to reach a hospital in Europe, where they can treat the brother, Allah, who is afflicted with leukemia. A boat from the Catalan NGO Proactiva Open Arms, which was monitoring the area near Libya, rescued them at dawn on Saturday, when they had been sailing for hours without a fixed course. “We saw them by chance, because they did not have any light,” the founder of the NGO, Oscar Camps, told Efe by telephone. He was the one who attended them at first and saw how the two eldest protected the child, with the way stuck in one arm, stretched in the fragile boat and wrapped in a blanket. 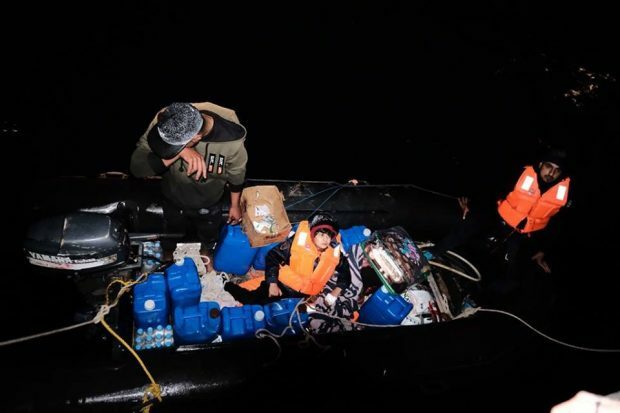 The three brothers, 14, 23 and 34 years old, sailed from a remote location about 50 kilometers from Tripoli, the Libyan capital, only with gasoline and water as luggage. At the time of the rescue, 35 miles from the coast and at the height of Tripoli, Open Arms volunteers were surprised to see that Allah had an intravenous line connected to a bottle of serum that he himself held, and that he handed them the paper from the Tripoli hospital where he had been treated. “They were lucky that we found them,” said Camps, since, although they are “always watching” in case boats appear, it did not have any light and did not give any signal to make themselves visible. After being rescued, Open Arms transferred the three brothers, along with another 106-people rescued in the same morning on the high seas, to the Aquarius vessel, from the NGO SOS Méditerranée. “Proactiva and SOS Méditerranée are the only two organizations that rescue people trying to reach Europe through the Mediterranean,” lamented Camps. Camps has informed Efe that today, Allah, Ahmed and Mohamed have disembarked in Augusta, a port town in Sicily (Italy), where he trusts the transfer of the child to a hospital. Camps has revealed that his NGO is already receiving calls from Italian doctors willing to treat the child. “We are trying to coordinate these proposals so that the brothers can decide what they are doing,” said Camps, who pointed out that one of the options proposed would be treatment at a hospital specialized in oncology in Milan (Italy). However, he has acknowledged that, at times, they maintain contact with the people they have saved, although it is usually the rescued people who contact them to explain how their lives are going. In the case of the three brothers, they will keep in contact and soon hope to know more about their history, since, as they did not speak English, the NGO recorded their story in Arabic and now they are translating it. “What these brothers have done is a heroic act,” the lifeguard emphasized. Camps recalled that people are fleeing Libya due to the complicated political situation – “there is no State” – and the high level of violence in the streets: “Everyone is armed,” he said.